Join us at our College and Career Expo for Arlington ISD High School students and all Arlington ISD parents! The event will be held on Tuesday, March 26, 2019 at the AISD Dan Dipert CTC 2101 Browning Drive, Arlington, TX 76016 from 5:00 PM – 8:00 PM. Sponsors include United Way of Tarrant County, inspirED and Arlington ISD. Click here for a map of the AISD Dan Dipert CTC. 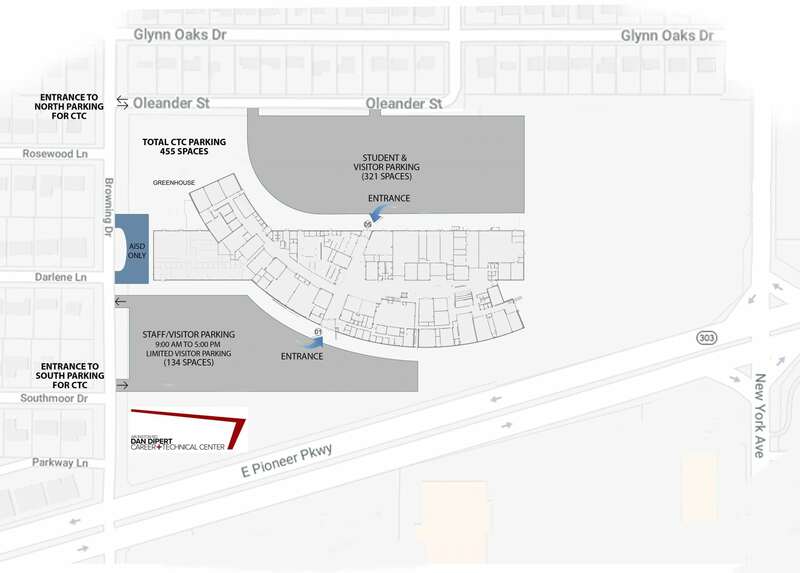 Additional parking will be available at St. Mathews Catholic Church located at 2021 New York Avenue, Arlington, TX 76010 (click here to view map). Shuttles will be available throughout the night to transport attendees to and from the AISD Dan Dipert CTC and St. Mathews. Click here to view our January edition of our newsletter. 09 Jul inspirED is now hiring GO Center Mentors! Are you interested in making a difference? As an inspirED GO Center Mentor you can have the rewarding opportunity to make a difference by serving as a mentor to high school and junior high school students in our high school and community based GO Centers. With the guidance and support of our GO Center Mentors, students are able to make their college dreams and aspirations a reality. To be eligible for this position you must be a work-study eligible student at one of our partner institutions and have reliable transportation. To find out more about becoming a GO Center Mentor or to apply, click here. Don’t miss out on this unique opportunity to impact the lives of students! Representatives from a multitude of Arlington organizations announced Thursday that together they will host the inaugural AISD Back to School Kickoff on Sat., Aug. 15, 2015 at AT&T Stadium in Arlington. The event will help 15,000 Arlington ISD students and their families get the supplies and resources they need to be ready for the 2015- 2016 academic year. The AISD Back to School Kickoff event will be hosted by the Arlington Independent School District and co-hosted by the Arlington NAACP, Junior League of Arlington, Churches of Arlington, The Gene and Jerry Jones Family North Texas Youth Education Town, and the Gene and Jerry Jones Family Arlington Youth Foundation. The collaboration is intended to maximize each organization’s resources in order to reach the most students in need. At the AISD Back to School Kickoff, which will be held from 8:00 a.m. to noon on the west outdoor plaza and indoor platform of AT&T Stadium, pre-registered students will receive a backpack filled with school supplies appropriate to their grade level, as well as the opportunity to visit a variety of resource booths. Booths will include an immunization station, vision checks, eyeglasses fittings, information on after-school care programs and more. Students and parents will also be encouraged to attend workshops led by the Arlington NAACP. Workshop topics will include college readiness, testing tips and more. Those who attend will be eligible for exclusive prizes. “We want students and parents to understand that student success is a team effort between their child’s school and families. Therefore, in addition to providing students with school supplies, we are offering workshops geared toward parents and some aimed at students at which they can learn more about very important topics such as: STAAR Testing standards, policies and rankings, literacy, in addition to student and parent responsibilities,” said Alisa Simmons, president of Arlington NAACP. Additionally, AISD Back to School Kickoff attendees can expect to see appearances by Dallas Cowboys mascot Rowdy, Dallas Cowboys Cheerleaders and former Dallas Cowboys players. In addition to the donation of AT&T Stadium as the event’s venue, the Gene and Jerry Jones Family Arlington Youth Foundation donated a $50,000 grant to go towards the initiative. To be eligible to attend the AISD Back to School Kickoff, students must qualify for the free or reduced-price meal program. Parents are required to pre-register their students by visiting www.aisd.net/kickoff. Transportation is available for pre-registered attendees and should be requested via the online registration form. Arlington community members and supporters may donate to the AISD Back to School Kickoff by visiting the event website, www.aisd.net/kickoff. A donation of $20 provides one student with a backpack and the supplies he or she needs for a full school year. Churches of Arlington, a coalition of churches that serve the Arlington community, and their congregations are driving the fundraising effort. “One of the great delights of this process is to watch the churches of Arlington band together for something significant. While all of us have been doing a lot individually, I am excited to see what we are able to do together. We believe that education is so important to the future of our city; therefore, we are grateful to play a part in providing the supplies needed for these kids’ success,” said Gary Smith, senior pastor of Fielder Church in Arlington. The Junior League of Arlington, with its more than 500 members, will play a key role in providing volunteer manpower for the AISD Back to School Kickoff event. “Volunteers bring smiling faces and open hearts to every cause, which helps to provide dignity where there may be little, and hope where it may be lost. They are the uniting force for executing meaningful and impactful community events. As a volunteer training organization, Junior League of Arlington members are dedicated to creating positive change within the local community and we are thrilled to have the opportunity to impact so many families with this event,” said incoming Junior League of Arlington president Emily Swanson. To learn more about the AISD Back to School Kickoff, including updates on participating vendors and how to get involved, visit www.aisd.net/kickoff. ARLINGTON – Arlington Assembly announced today it will provide $100,000 in grants to various community agencies through the General Motors Foundation’s Plant City Grants program. These grants will be used to help fund essential outreach programs aimed at building a stronger community and enriching lives in the Arlington area. ◾Arlington Independent School District Foundation– $10,000 will support teacher grants, bringing new opportunities for innovation and technology into classrooms across the Arlington ISD. ◾Community Food Bank of Fort Worth – This $10,000 grant will help feed more than 450 local families and support the operational expenses for the food bank’s mission. ◾InspirED (Higher Education Servicing Corporation) – A $5,000 grant will support programs to encourage students and families to be college ready and to provide detailed guidance on such things as admissions, testing, scholarships and the intricacies of applying for financial aid. ◾Junior Achievement of the Chisholm Trail – A $10,000 grant will support this high school activity-based, interactive instruction, which focuses on entrepreneurship, financial literacy and college readiness. ◾Arlington Independent School District Foundation – $7,500 will support the Global Rivers Environmental Education Network (GREEN) program, which brings hands-on education outdoors. ◾Mansfield Independent School District Foundation – $7,500 will support the Global Rivers Environmental Education Network (GREEN) program, which brings hands-on education outdoors. ◾River Legacy Foundation – A $10,000 grant will support the Global Rivers Environmental Education Network (GREEN) regional programs and help reach more than 1,000 students through its water monitoring events. ◾Texas Alliance for Minorities in Engineering (TAME) – A $10,000 grant will provide an opportunity for Remynse Elementary School to host the “TAME” trailblazers, a one-of-a-kind science museum on wheels, for its students. ◾United Way of Tarrant County – A $20,000 grant will help support its mission to help the community learn well, earn well and live well in Tarrant County. ◾University Crossroads (University of Texas – Arlington) – A $10,000 grant will help local students navigate the road to higher education. The GM Foundation grants are given to a wide variety of organizations across the country that families rely on to provide much-needed services, improve education and positively impact the quality of life within their respective communities.